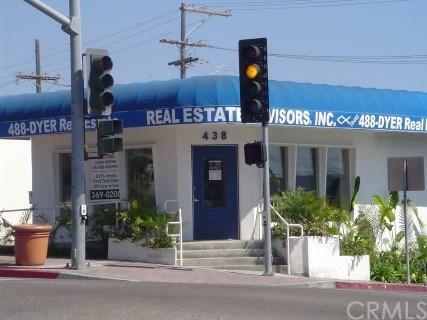 HIGHEST VISIBILITY COMMERCIAL CORNER location in downtown San Clemente. Location, location, location. Every vehicle that gets off at Avenida Palizada to head to downtown or the pier must face this property while waiting for the light to turn left. Terrific central location. El Camino Real is the Pacific Coast Highway going through San Clemente. This cornerstone property is know as the gateway building because it is literally at the gateway of downtown San Clemente and the pier. High traffic, busy signalized intersection just off the freeway. Perfect for most retail, office, financial, law, insurance, food, medical (must check with City of San Clemente). #1 location. Currently used as real estate office but can be vacated with 30 days notice. Configured with 5 desks plus private office, upscale granite counters in the kitchenette & bathroom. New roof in 2015. Building is 800 square feet, approximately 20 x 40. ADA compliant 2005 (wheelchair ramp, bathroom and parking).